I have never been a big fan of yogurt. Until I realized that I’m just not a big fan of commercial yogurt that is loaded with artificial flavors and preservatives. I grew up in a household where most of our food came from boxes or the freezer. Now that I’m older I’ve come to realize that a lot of the foods I hated growing up were just bad versions of those foods. Another sad fact is that a lot of the time it isn’t the food that is to blame, it’s the person cooking the food. I always thought I hated eggs, until I realized that I just hated the way my mom cooked eggs. It usually only takes one bad experience to taint our opinion of a food forever. That’s why I try to keep an open mind and if I want to try something new or something that I haven’t been fond of in the past I make sure that I cook it myself or find the best version of that food possible so that I make sure that it’s not the technique or quality that I have an issue with. 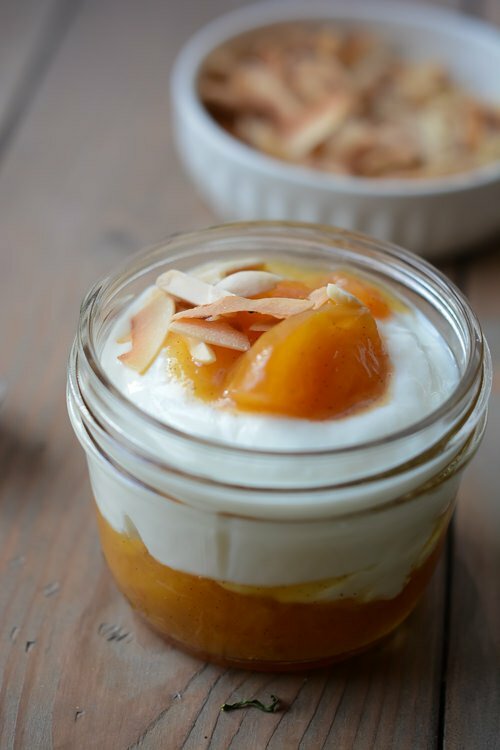 parfaits with some homemade peach jam that I’ve had hanging out in the freezer and topped them with some slivered almonds and toasted granola. 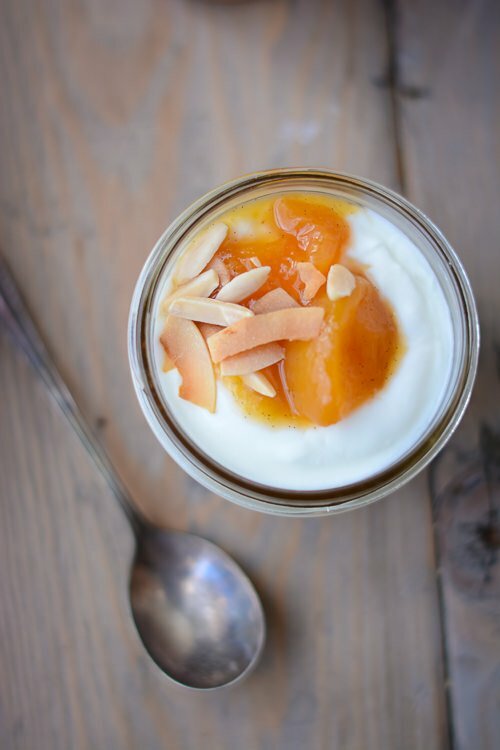 Yogurt will keep in the fridge for up to two weeks and remember to always save a few tablespoons for your next batch! What grocery staples do you prefer to make at home yourself? I’d love to hear from you! Start with the best quality milk you can find and watch your temperature. 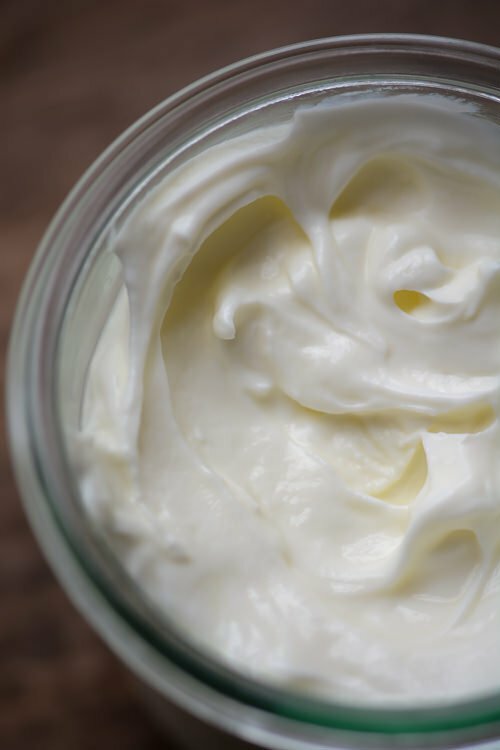 Strain the yogurt through a few layers of cheesecloth for greek style yogurt. Heat the milk in a large pan over medium heat, stirring and scraping the bottom of the pan often with a heatproof spatula, until a thermometer registers 185 degrees. Let the milk cool to 115 degrees. To speed the process you can fill a large bowl with ice water and set the bottom of the pot into the ice bath to cool. Once you have reached 115 degrees, whisk together 1 cup of the heated milk and the yogurt. Stir into the remaining milk. Transfer the mixture to a 1 quart mason jar. Wrap jar in a clean kitchen towel covering completely and put in a warm place to sit undisturbed. 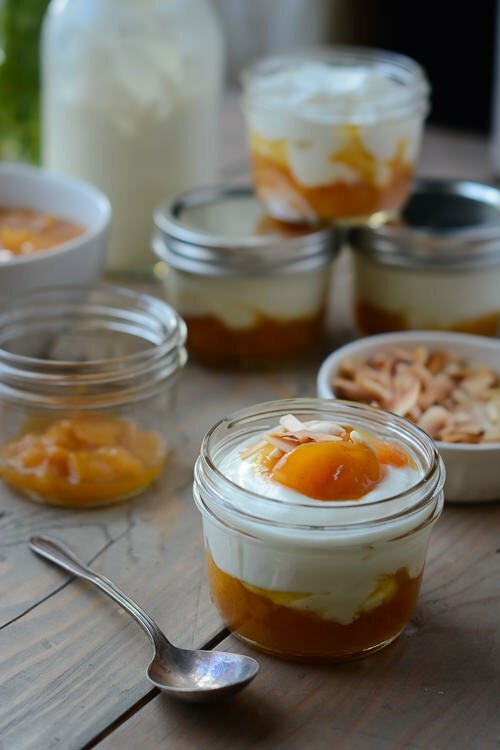 A oven with the light on is a good choice to incubate your yogurt. Let sit for 4 to 8 hours until the mixture has the consistency of custard. Cover the jar and refrigerate before serving. 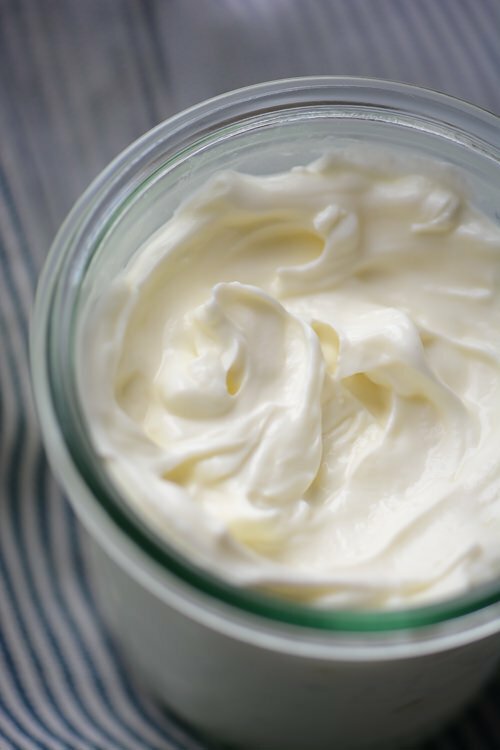 For thicker, Greek style yogurt strain the yogurt through a several layers of cheesecloth for 1-2 hours. My goodness, your yogurt looks so thick and creamy! Are the pictures of the strained yogurt? I can never get mine that thick. 😉 Other than yogurt, I like to make nut and oat milks, paneer, and granola from scratch. Same issue you have with the store-bought versions having an off/chemical taste to them. And I want to start making harissa sauce as well but still in the brainstorming phase of that one. Yes, that is the yogurt after it had been strained for a few hours thru a few layers of cheesecloth. I prefer it without all the whey, and I like the thicker texture especially if I’m going to make a dip or sauce with it. I’ve been wanting to try making my own yogurt and this has pushed me over the edge. 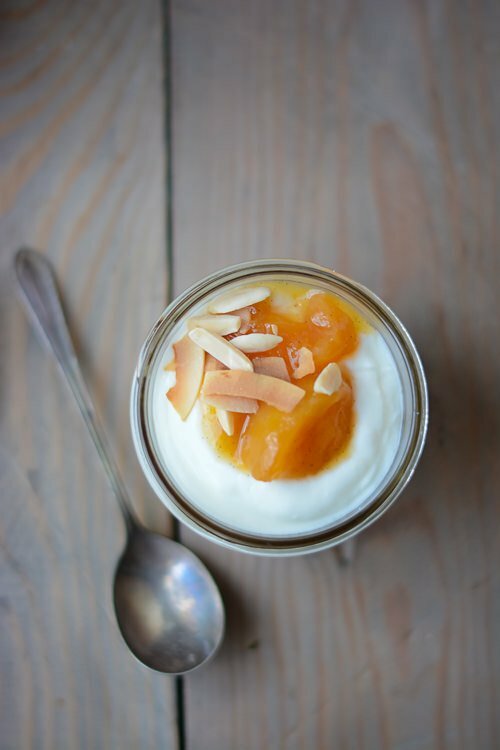 I’m a fan of the thick, Greek-style yogurt, which is hard to find here in Ireland. 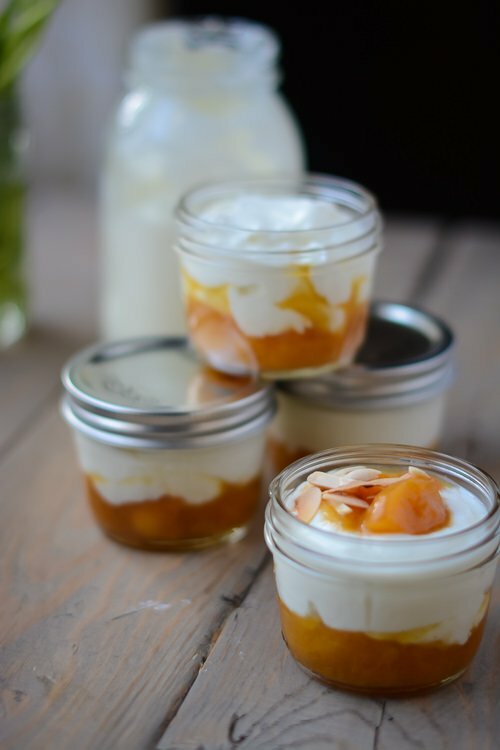 Yours looks divine with those pretty peach preserves! It really is so easy to make, just a little investment of time. I usually cook up a batch when I know that I’m cooking something else that will keep me occupied for a little while. Just make sure when you pick a starter to use a yogurt that you like to eat. I’ve made the mistake of using a yogurt that I wasn’t too fond of and the result was sour and too tart for me. Let me know what you think if you do try it! this looks divine. thank you! 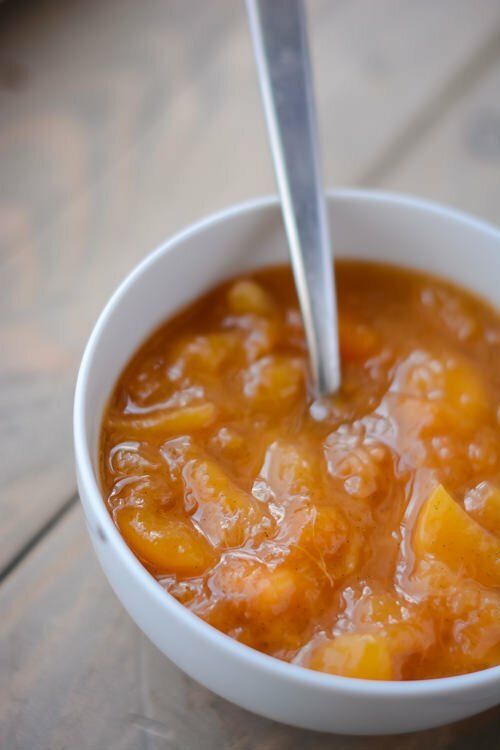 please share that peach jam recipe if you have it. 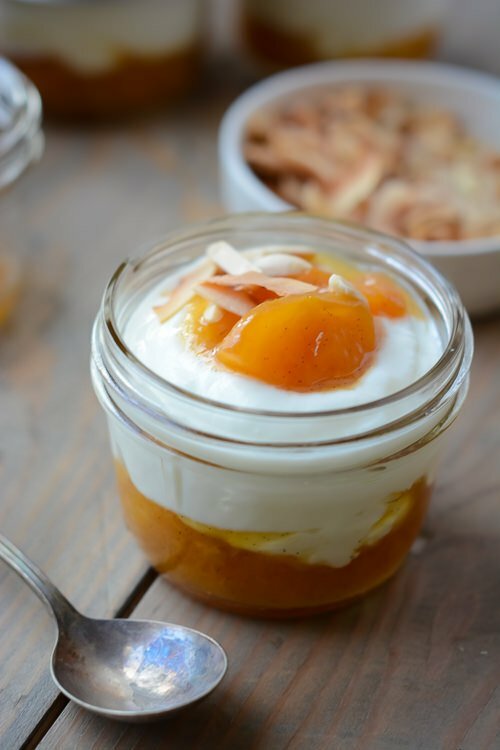 I’m trying to can one thing a month and peaches are my favorite!